Shortly after the note went out, Google stock hit a 52-week low. That was not a huge surprise. “We are concerned about the disintermediation of search by apps and this could impact core search growth. While this is extremely difficult to quantify, qualitatively, we believe that consumers’ increased dependence on mobile and apps is negatively impacting GOOG’s core search.” So begins Macquarie’s “bottom line for 2015″ for Google. Macquarie is the latest in a string of investment banks to strike a note of caution when it comes to Google. Also last week, JP Morgan revised its estimates for Google’s stock downwards, from $670 to $600 per share. 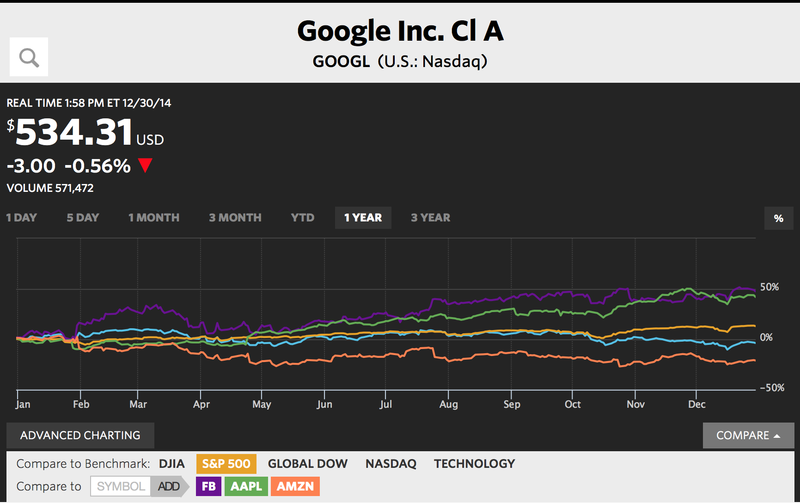 (Google closed at $516.35 on Dec. 19.) “We are lowering our estimates on Google for 4Q14, 2015, and 2016 to account for slower organic growth, continued strength in the USD, and ongoing investment opportunities,” analysts wrote in a research note to clients. As we’ve noted before on MTP, Google has often underperformed not only the market but also the “Gang of Four” as Eric Schmidt calls the GAAF oligopoly (Google, Apple, Amazon and Facebook). Why? Maybe it’s because of Google’s Internet of Too Many of Other People’s Things.